Theodoric the Great (454-526) - The Italian kingdom founded by Odoacer did not last long. In fact, he was its only king. After he deposed the last Western Roman emperor, Romulus Augustus, he reigned for 17 years before he himself was overthrown by Theodoric of the Ostrogoths. 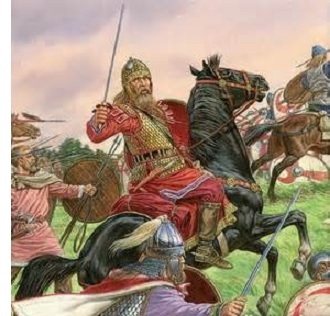 The Ostrogoths were a Germanic people originally from central eastern Europe who swept down from the present-day Ukraine region in search of more fertile lands and people to plunder. By the end of the 5th century, the Roman Empire had become so weak, it was unable to prevent them from occupying its northern provinces. Interestingly, the Ostrogoths participated in the Battle of Nedao which threw off the yoke of the Huns many Germanic tribes had been under. It was fought in 454, the same year Theodoric was born. His father, Theudemir, had been a vassal of the Huns. After Attila died, a coalition, led by the Gepids, attacked the Huns sensing their vulnerability. The victory may very well have paved the way for Theodoric's eventual rise to power. He was born in Panonia which was officially Roman territory, but heavily occupied by Germans at that time. In 461, as a young boy, he was sent to Constantinople as a hostage. It was an arrangement that the Eastern Empire had made with the Gothic people. In exchange for living in Roman territory, their young princes were sent to the capital to be "Romanized". Theodoric was educated in the royal court and after 10 years, he returned to his people. His father died only three years later, and Theodoric became king of the Ostrogoths in 474. He had been an ally of the Eastern Empire as a result of his upbringing, but the fall of Rome in the West stirred within him ambitions of his own. In 487, he effectively abandoned his alliance with the Eastern Empire and marched an army upon it. Emperor Zeno had little appetite for combat with the Ostrogoths and came up with an alternate plan to warfare. He successfully convinced Theodoric that Italy offered richer lands and an easier target. Theodoric bought it, and turned his army west. He entered Italy in 488 and engaged Odoacer's army the following year. In 489, he won the Battles of Isonzo and Verona. The next year, he was again victorious at Adda. Theodoric now controlled northern Italy and settled in on Odoacer's doorstep.. Then in 493 the capital of Ravenna fell to the Ostrogoths. But Theodoric had a flare for the dramatic. He signed a treaty with Odoacer agreeing to joint rule over Italy. They held a huge banquet to celebrate their new alliance. That night at the feast, Theodoric stood, made a toast, and then killed Odoacer with his bare hands. His way of nullifying the treaty apparently. Unlike Clovis I, whose reign was marked by almost constant warfare, Theodoric turned more to diplomacy after conquering Italy. He married Clovis' sister, Audofleda, and married off several of his female relatives to other Germanic rulers whose kingdoms were next to his own. Our information about this period comes originally from a Roman writer named Cassiodorus who served in Theodoric's court. He wrote extensive records, which are now lost. But they were collected and summarized by another Roman named Jordanes, who took up history later in life. His work, Getica (Origin and Deeds of the Goths), survives and is the only extant record of the Ostrogoths from this time.